Back home in Europe after World War II, Atlantide continued to attract admiration wherever she went. 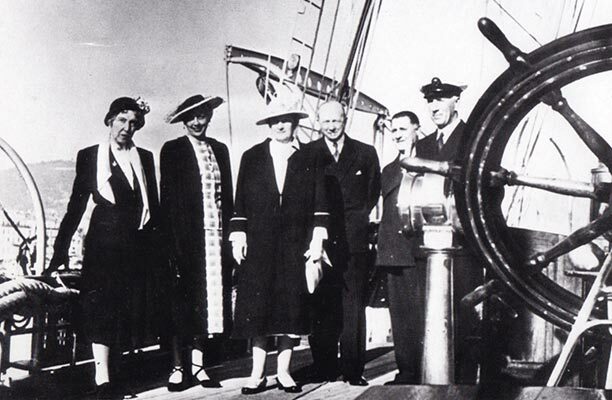 Members of the European aristocracy were frequent visitors – King Christian and Queen Alexandrine of Denmark; King Umberto of Italy; Baudouin, the young King of Belgium, and his father Ex-King Leopold; even the Duke and Duchess of Windsor. So impressed was the Duke, who had abdicated the throne some years before, that he turned to Jarl during one of the Dane’s lavish parties and announced, “I wish I could afford to buy this boat.” She was even seen in Monte Carlo on the night Grace Kelly married Prince Rainier of Monaco, though it’s not known if Jarl was a guest at the ceremony. Sadly the good times could not last. Viggo Jarl found himself ruined by post-war economic difficulties and had to sell the yacht – and thus began a period that is still shrouded in mystery. Apparently, at one point a company in Honduras owned her, then a secretive businessman in Cincinatti, known as Julius Fleischman, took control. Rumours abound that she was used to smuggle guns, drugs and all sorts of illegal cargo throughout the Americas and Caribbean – but hard evidence of these nefarious activities has never been found.